The amulet is made from Nuea Loha Saksit (Sacred Artifact and Yantra Foil Metals). Released in a great Buddha Ahiseka Ceremony of National Historic Importance, initiated by Her Majesty the Queen and Royal Princess, with Ajarn Chum Chai Kiree of the Dtamnak Dtak Sila Khao Or Southern Academy of Sorcery performing the Brahman Laymaster Invocation of the Devas,. The Ceremony was held at Wat Pratat Doi Sutep in Chiang Mai, in the year 2515 BE. The Amulets were Blessed in the Ceremony by 108 Master Monks from around the country. Some of the most famous of those Masters, included; LP To (Wat Pradoo Chimplee), LP Kasem, LP Hwaen (Wat Doi Mae Ping), LP Guay (Wat Kositaram), Kroo Ba Chum (Wat Wang Mui), Kroo Ba Kam Saen (Wat Pha Don Moon), and Por Tan Ajarn Nam (Wat Don Sala). a second Ceremony was performed in 2522 BE at Wat Chumpol Nikayaram for this special edition through the Merits of Ajarn Chum Chai Kiree of the Dtamnak Dtak Sila Khao Or Southern Academy of Sorcery. 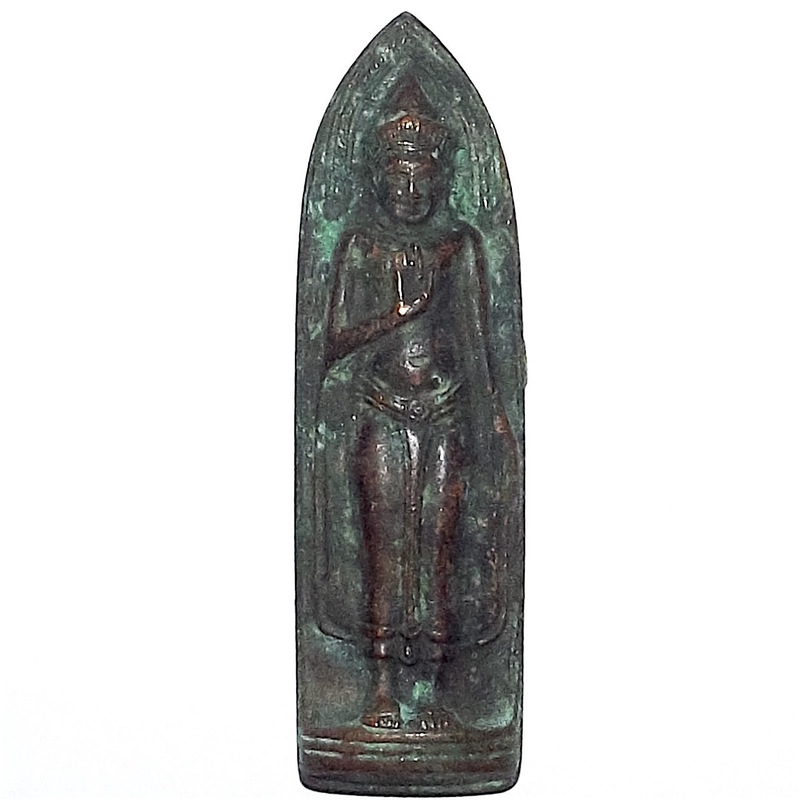 The Pra Ruang Pratat Chedi amulet is styled in the Periodic Artistic Style of Khmer Influence of the Lopburi Era, with the Buddha wearing a Khmer style Crown as seen by the Rulers of the Lopburi Era Kingdom. The Budda is wearing a fully wrapped Civara robe with immensely detailed regalia. The face of the Buddha is clearly of Khmer artistic influence, and highly defined in its details. The amulet is considered a masterpiece of Miniature Buddhist Art. Pra Ruang Rang Pern Wat Doi Sutep 2515 BE empowered in an Important and Officially Documented Putta Pisek ceremony at Wat Doi Sutep, with the Great Honorable Presence of the Great Arahant Luang Por Kasem Khemago, to assist in the Empowerment. This is the 'Pim Prataat Chedi Jom Dtua Mia' (Indented relic Stupa - female), which is notable by the concave Chedi Stupa on the rear face, there was also another version with an protruding Chedi Stupa, known as 'Pim Prataat Chedi Noon Stua Phu' (raised Chedi Stupa - male). This amulet was one of a number which were taken by Ajarn Chum Chai Kiree after the ceremony, and enpowered further by Ajarn Chum for a period of another 7 Years. He then took the amulets and reblessed them once more in a Grand Buddha Abhiseka Ceremony with Master Monks at the temple of Wat Chumpol Nikayaram, in Ayuttaya, on the 7th July 2522 BE. This edition is hence very special and rare, for the fact that it is not just the already amazingly Sacred 2515 BE Wat Pratat Doi Sutep Amulet, rather, has also been empowered by Ajarn Chum Chai Kiree for an extra 7 years, and then been Blessed once more with Great Master Monks at the temple of Wat Chumpol Nikayaram, to put the 'cream on the top of the cake'. What more could a devotee of Buddhist Amulets look for, than an amulet of this calibre, with blessings and empowerments from the great Ajarn Chum Chai Kiree of the Dtamnak Dtak Sila Khao Or Southern Academy of Sorcery, and Blessed in Puttapisek by some of the Era's Greatest Practitioners, including Luang Phu To (Wat Pradoo Chimplee), the Great Arahant Luang Por Kasem Khemago (Sussaan Trailaks in Lampang), Ajarn Nam Gaew Jantr, LP Hwaen (Sujino), Kroo Ba Chum Kroo Ba Kam Saen, and the inimitable Luang Por Guay, of Wat Kositaram? The Devotees of All of these Great Masters both highly revere, and Seek this amulet extremely because of his Personal Involvement in the empowerment ceremony, and this in itself makes the amulet an ever rarer to find amulet. It is also a highly favored amulet with members of the Military, and the Police force, for its Kong Grapan Chadtri and Klaew Klaad, Serm Yos status increase, and Maha Amnaj Commanding Power to Influence Minions. Amulets blessed by Luang Por Guay are now becoming so rare and ever increasing in price, that any editions which he was involved with are becoming highly sought after. The presence of Luang Por Kasem is in itself another factor which makes this amulet a highly faith instilling Buddhist Artifact, in addition, the Powerful Magic of Luang Phu To of Wat Pradoo Chimplee being bestowed upon this All Time Eternal Classic Buddhist Amulet, makes it Undoubtably a Best Choice for any and every Buddhist. The Devotees of the Lanna Olden Days Masters Kroo Ba Kam Saen, and Kroo Ba Chum, are also included in the many groups of collectors of this amulet. The rear face shows the indented concave Chedi Stupa, making this a 'Dtua Mia' Female model. The other version, is called 'Chedi Noon' means 'Bulging' and 'Dtua Phu' means 'Male' This refers to the fact that, if the Chedi is bulging out as a convex form, it is called male, and the inwards receding concave version, is the 'Dtua Mia', Female version. in the first Ceremony at Wat Pratat Doi Sutep, Apart from the Pra Ruang Rang Pern,there were many other amulets blessed in this very same ceremony of importance, including the Pra Kring Chiang Saen, Rian Pra Putta Sihingk Buddha Coin, Rian Pra Jao Saedtangka Muni Buddha Coin (Wat Chiang Man), Rian Luang Por Tan Jai Buddha Coin Amulet, Rian Kroo Ba Sri Vichai Monk Coin Amulet, Rian Jao Kun Pra Racha Sit Ajarn Monk Coin Amulet, and the Rian Jao Kun Pra Apay Sarata Monk Coin Amulet. All of these Amulets are now Rare Collectibles, Extremely Valued by Devotees of the Northern Lanna Buddhist Traditions. Comes with original box from the last ceremony was performed, and it was thereafter released at Wat Chumpol Nikayaram in 2522 BE.